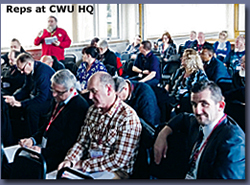 Despite general agreement that BT’s Group-level policies and online advice for those undergoing mental health crises are industryleading, speaker after speaker at a special CWU branch forum cited troubling examples of how fine words are all too often not being put into practice – with sometimes devastating consequences for those suffering mental health meltdowns. That stark message was delivered to BT’s global heath & wellbeing clinical lead, Bruce Greenhalgh, and senior BT Employee Relations personnel on January 29 at a specially convened follow-up to an earlier branch forum that the company was unable to attend in October. * Secure changes to the highly insensitive wording in standard letters sent out under the attendance process to reduce the particular distress they cause to people already suffering mental health problems. A BT GROUP-WIDE PROBLEM Sara Miah of North Anglia Branch insisted Openreach was another problem area – citing the stress suffered by new joiners in Service Delivery as they struggle to meet expected performance levels while still effectively learning on the job. “We’ve all got a plethora of horror stories,” she began. “One of my roles in the branch is welcoming all our new members and when they start they’re full of promise, enthusiastic and can’t wait to get going. If you talk to them a few months later, however, it’s a very different story. I’ve lost count of the number of new joiners that have left – not just because they are being managed out for performance or attendance, but because they decided they don’t want to work for BT or Openreach because they’ve decided they are not the companies they thought they were. 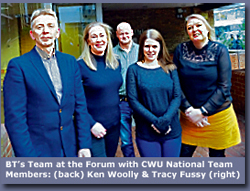 Michelle Sherry of Coventry Branch agreed, citing her particular concern for young recruits in Service Delivery who find themselves struggling to keep up with onerous workloads while still learning the ropes. “I was one of those new recruits four and a half years ago, and the stress it causes is so unhealthy it’s unreal,” she recalled. “I can only describe it, from my own experience, as like having your head in a vice. You’re having to learn all this new knowledge, you are not given time to absorb it – all you’re worrying about is the job you haven’t yet got to, so you’re running around like a headless chicken. Colin Wilks of Lancs & Cumbria Branch agreed. “What are you going to do to help new starters overcome stress and mental health issues when they are under such pressure to produce and are just new to the business?” he asked. Some of the cases recounted by reps drew gasps from the room. Josh Williams of Greater London Combined Branch recounted a fact-finding and discipline case levied against a member for an ‘inappropriate message’ she’d sent to her manager late at night saying she was considering suicide. Malcolm O’Brien of Lincolnshire & South Yorks Branch, meanwhile, told of an initial formal warning that had just been issued to a member who’d been diagnosed with suspected cancer – a cruel blow to someone already experiencing major stress that was compounded when he was refused special leave having been summoned to hospital for an emergency operation. Rossana Hawkins of Capital Branch told of the crass insensitivity displayed by extremely young managers to two long-serving middleaged female employees. One, she explained, is now off sick having suffered three heart attacks shortly after being disciplined for lateness that had been triggered by multiple health issues, including high blood pressure and an altered mental state associated with the menopause. The other has just received the infamous long-term sick review letter with its warning of the possibility of ‘employment being terminated’ having had time off for cancer treatment. “The Forum was really useful and it was clear to everyone that the BT people in attendance are absolutely genuine in trying to change things for the better. The points made by the branch representatives were really powerful – the key message being that the company already has great policies but it is in the implementation of those policies that it is sometimes falling short. There’s clearly an issue we need to deal with in regards to new starters, deficiencies in mental health awareness that need to be addressed and a particular issue with the training of managers that our reps are keen to see happen quickly.